UFC lightweight champion Khabib Nurmagomedov leaped out of the octagon after submitting Conor McGregor on Oct. 6 and attacked McGregor’s teammate Dillon Danis. The incident sparked a brawl between the fighters’ training camps, which all took place live on the UFC’s record breaking UFC 229 pay-per-view. The Nevada State Athletic Commission (NSAC) has since decided to freeze Khabib Nurmagomedov’s $2 million payday while they continue their investigation into the incident. Meanwhile, Nurmagomedov’s teammate Zubaira Tukhugov has been banned from the UFC for having allegedly attacked Conor McGregor during the fracas. Khabib Nurmagomedov has since issued an ultimatum to the UFC. The reigning UFC lightweight champion wants his teammate reinstated into the UFC. If Tukhugov is not reinstated, Nurmagomedov claims he will also leave the promotion. 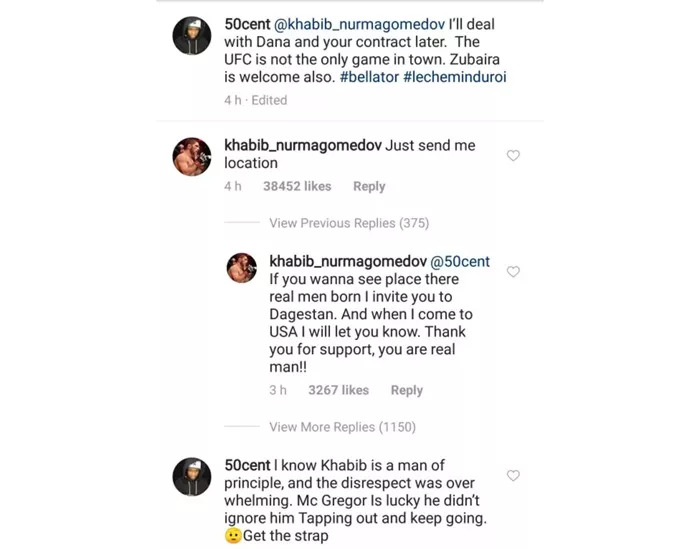 Meanwhile hip-hop icon 50 Cent, who recently landed a partnership deal with competing promotion Bellator MMA, has gone on to offer Khabib Nurmagomedov his full $2 million payday if the UFC champion signs with Bellator MMA. Khabib Nurmagomedov has since gone on to respond to the iconic rapper, revealing an interest in setting up a meeting. Well, 50 Cent has now come forward with a new message concerning the matter. Check it out below.